This Wednesday, the New York State legislature held its annual joint Senate and Assembly budget hearings on the topic of education in New York State. These hearings directly impact the final budget allocations for education-related expenses in the state. The legislature heard testimony from State Education Commissioner MaryEllen Elia, New York City Schools Chancellor Richard Carranza, and other stakeholders. 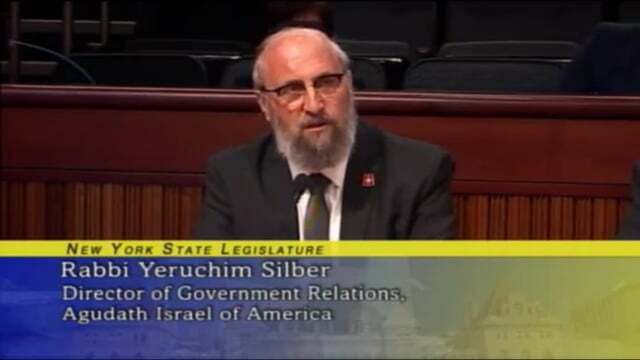 Rabbi Yeruchim Silber, Agudath Israel’s Director of New York Government Relations, testified on matters of concern to the Orthodox community. On the matter of substantial equivalency, he noted, with concern, that the process for the substantial equivalency guidelines did not include sufficient public input and comment, and that the Agudah supports an outcomes-based metric for school success. Saying that a “one size fits all” set of rules for schools is not educationally sound, nor fair to the schools who are producing students who have some of the highest pass rates on the Regents’ Exams, Rabbi Silber said that the Agudah is willing to work with the State Education Department in coming up with a set of guidelines that could better serve all the students in the State of New York. Rabbi Silber also testified regarding other issues of concern: He requested that the legislature restore to the budget a $7,000,000 allocation designated to reimburse non-public schools for their expenses in enforcing the state mandate for immunization compliance. He also requested that the budget include an increase in school security funding for non-public schools, noting that neighboring New Jersey just doubled the security allocation for non-public schools, and the increased security risks facing schools. @markee1 It says only org TESTIFYING on their behalf. Many wonderful groups represent and support.